SFSU journalism students hear a presentation about Bay News Rising by project director, Kat Anderson (center). Journalism students at San Francisco State University got a preview of the 2013 edition of “Bay News Rising,” a summer mentorship program our Guild local started last year through a collaboration with the Berger Marks Foundation. Kat Anderson, center, serves as project director of the innovative program, which offers paid work opportunities, individual coaching and introductions to Bay Area news organizations. She spoke Tuesday night to students enrolled in an internship seminar at San Francisco State, led by journalism professor Yumi Wilson, one of the mentors and program advisors working with the Bay News Rising participants. Applications are being accepted now for Summer 2013 students. We expect to have spots for about 14 writers and photographers. Students are offered student membership and working press credentials through the Guild Freelance Unit. They are paid stipends as well as freelance fees for quality work accepted for publication. Last year, student work appeared on this website, Fog City Journal and the San Francisco Bay Guardian.We are recruiting mentors, seminar leaders and editors, including journalists outside the Bay Area who can help edit and critique student work. Please contact Kat Anderson at (415) 420-7503 if interested. The program emphasizes coverage of social justice issues, particularly labor and women’s rights. This summer, through a collaboration with the nonprofit San Francisco Public Press, the program will pay special attention to minimum wage standards and other economic policies designed to address income disparities. National Guild leaders have been actively supporting the student program, as well as related efforts to organize freelance units around the country. 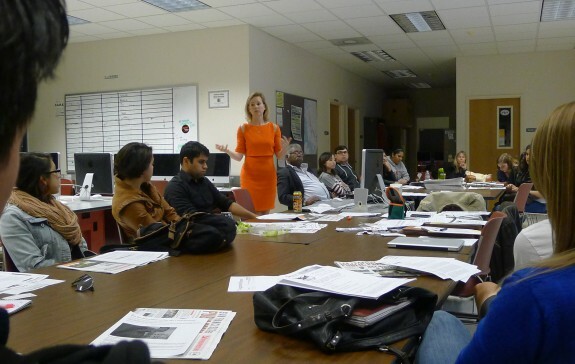 A presentation on the Bay News Rising program is on the agenda at the Newspaper Guild Sector Conference, being held April 19-20 in Pittsburgh, PA.